Kristin Bauer and Physicians Committee for Responsible Medicine launch campaign on Change.org asking U.S. Fish and Wildlife Service to extend endangered species protections to captive chimpanzees. WASHINGTON, DC – Actress Kristin Bauer, who plays Pam on HBO's True Blood, has launched a campaign on Change.org with the Physicians Committee for Responsible Medicine urging the U.S. Fish and Wildlife Service to protect captive chimpanzees. Bauer’s online campaign asks the U.S. Fish and Wildlife Service to extend the endangered species protections currently given to wild chimpanzees to captive chimpanzees used in experiments and the entertainment industry and kept as pets in United States. 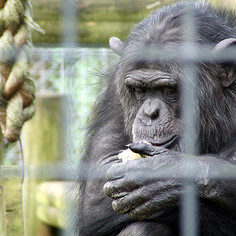 Bauer cites studies demonstrating that when people see chimpanzees used in commercials and interacting with humans in the media, they are more likely to believe that chimpanzees not only make good pets, but that they are not endangered in the wild. Bauer’s campaign is likely to draw national attention to the lack of protections for captive chimpanzees. The actress is encouraging True Blood fans to sign her online petition campaign on Change.org, the world’s fastest-growing platform for social change. A proposal to extend protections to captive chimpanzees is currently under consideration by the U.S. Fish and Wildlife Service. The public comment period for the proposal ends October 31.